It all caught up with me. There I was with my sister and our better halves on the terraces at Kardinia Park, in tears. It was Wayne Campbell’s 297th and final match for the Richmond Football Club, and the only occasion that the emotions have gotten the better of me at the footy in the form of tears. There were a number of factors involved at the culmination of that match. Firstly, there was very narrow defeat at the hands of the more fancied Geelong. 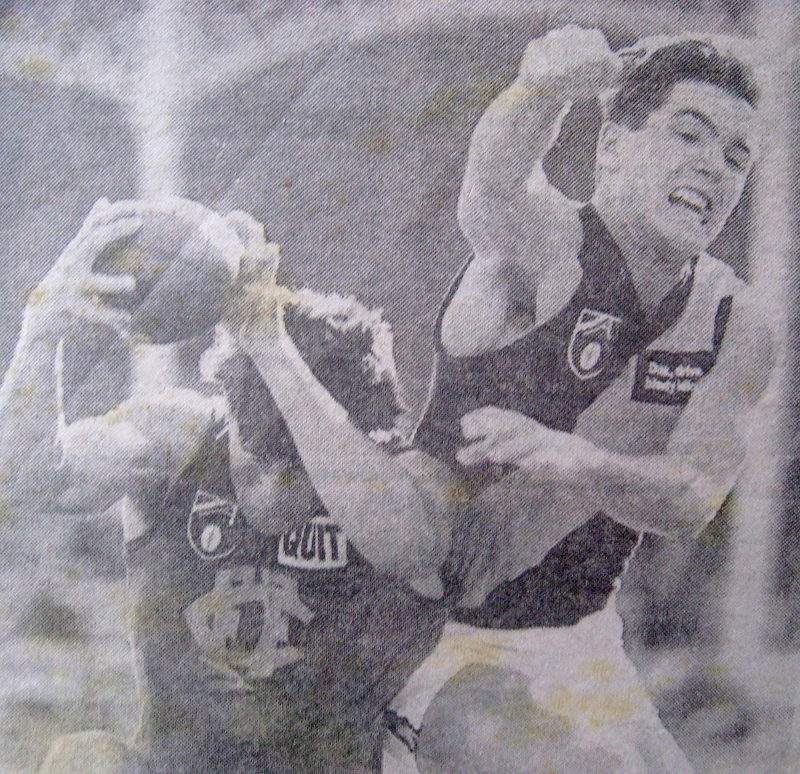 We hadn’t won down at Kardinia Park since 1990, the year before Campbell debuted for the Tiges. But I’ve seen many a similar loss with no tears. Secondly, it all came home that the much maligned Campbell had really given his all for the club, and did the honourable thing of bowing out just three games shy of the illustrious 300 figure. And thirdly, it made me feel old and nostalgic. 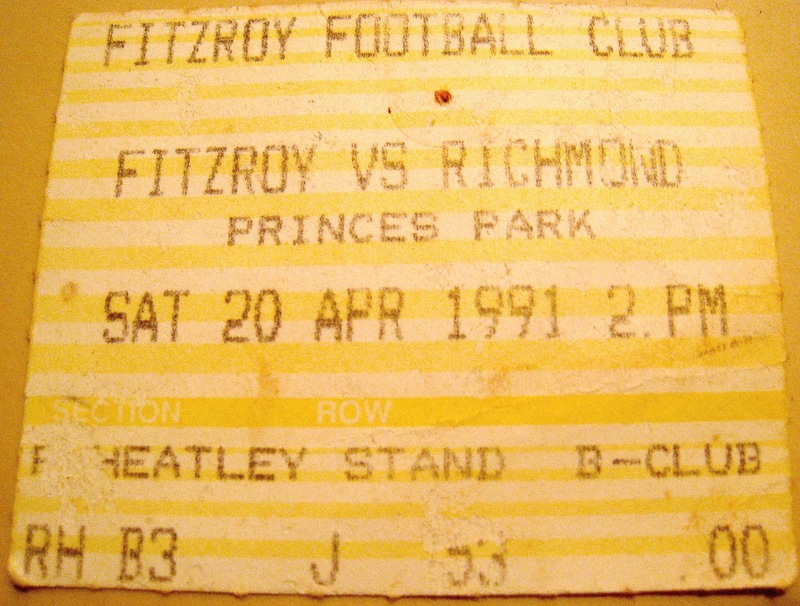 Not a lot of people know this, but Wayne Campbell and I debuted for the mighty Richmond Football Club on the same day in 1991 against the old Fitzroy at Princes Park. Wayne donned the number 46 for the seniors, and I the number 6….for the little league. What a thrill. My ticket to Wayne Campbell’s first and last matches. They don’t make tickets to last these days! I was actually below the cut-off age to be playing, but the guy running the Laburnam Footy Clinic (pre-branding), Kevin O’Mally, told a fib about my age and got me a game. As the lone Richmond fan amongst a sea of Hawks, Bombers and Pies, he must have pitied me. 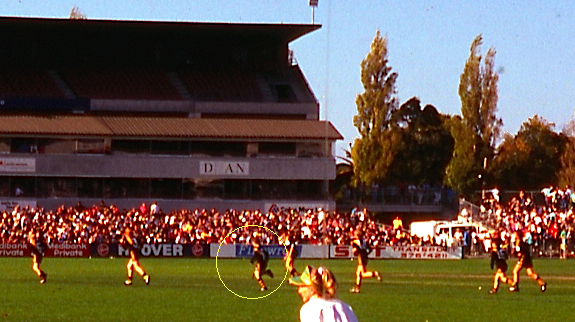 You’re going to have to take my word for it but that’s me circled, a fair bit smaller than everyone else, running from the ground having just played for the Tiges. I kicked a point with what was the only possession that I can recall having. We were bundled up into the Heatley Stand for the first quarter and a half, me being the only one in my team who was invested in the match. We circled the boundary before half time and headed into the musty old rooms to change, where a few reserves players were still gathered. 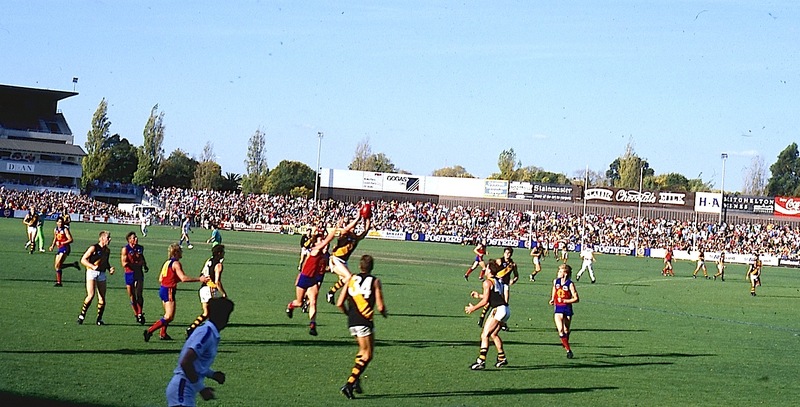 I remember hearing the roar of the crowd, and desperately hoping it was for a Richmond goal. The match itself was a blur and I remember little other than struggling greatly with the water bottle, the likes of which I’d never used before. Coughing and spluttering ensued. As I took my place with mum and dad after ‘my’ match, I learned that they had situated themselves behind two of the most obnoxious and loud mouth Roy supporters that ever lived. Luckily we got up. But back to Wayne Campbell. You can see him above in game one, positioned perfectly for the hit out from the ruckman. Number 46 remember. Reading the game and being a step ahead were clearly natural to him from day dot. ‘Cambo’ wasn’t my favourite player, but the more I reflect on his career, the more I appreciate him. Amongst 4 club best and fairests and club captaincy, he polarised Tiger fans, for reasons I could never understand. 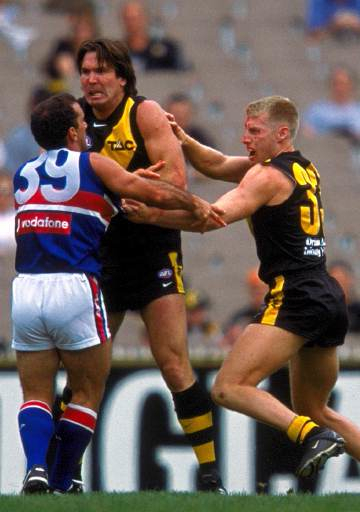 He was instrumental in driving Richmond up the ladder in the latter part of 1994 and in 1995 he finished the home and away season as Brownlow favourite.The back end of the 1999 season saw the Tiges really struggle, but Campbell really shone at this time showing great leadership. I thought Campbell was tough and put his body on the line, prepared to take physical punishment so as to release team mates into space. But his ‘footy brain’ was his strength, his adequate skills aided by his decision making. At times you could literally see his brain ticking over, thinking one or two moves ahead. Yet it’s Wayne’s loyalty which I value most. He could well have left for greener pastures, and from a professional point of view, perhaps should have. But he stayed. 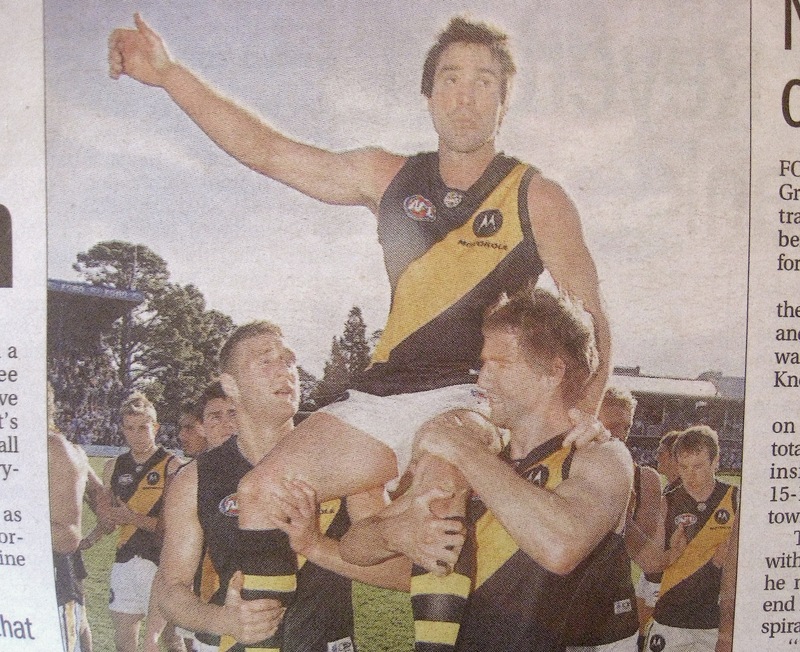 When handed the captaincy in 2001, to the disgust of many Tiger fans given he replaced Matthew Knights, one of his first acts as skipper was to fly the flag for the man he replaced. Tony Liberatore king hit Knights behind play, and Campbell stood up against Libba both physically and with words throughout the week, breaking the ‘players code’ of silence. So I cried a bit when Wayne finished up, getting to that age where I was seeing blokes retire whom I remembered playing their first games. Slowly l am getting used to that. 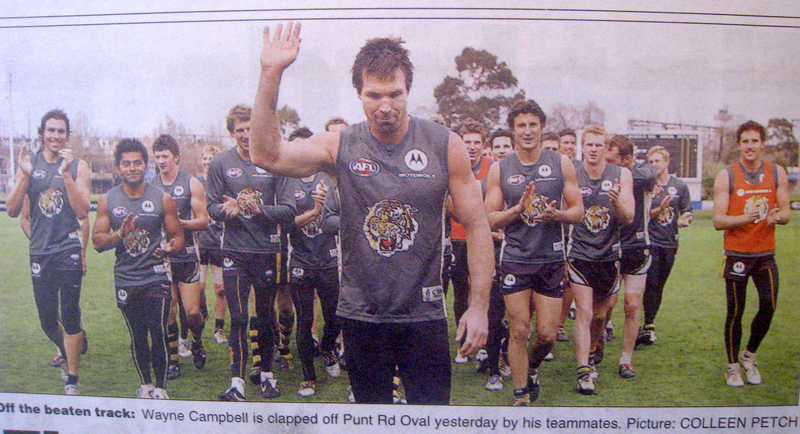 As Campbell started his career, I still had stars in my eyes of one day representing Richmond, unable to acknowledge the slim chances that faced me. Watching Wayne trudge off for the last time, head in hands, was like a sledgehammer reminding me that I would never make it, and it struck me how hard he had worked in his career for no success. Sometimes this game isn’t fair. Wayne Campbell, it was a pleasure having you represent my footy club.